Biologists have discovered the world's tiniest species of snail in China, measuring not even a millimeter in length. 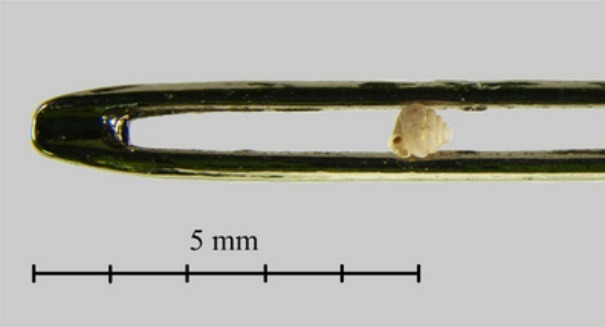 Researchers in China have discovered an unbelievably small species of snail. According to a report from the Guardian, the snail species, discovered in Guangxi province in the south of China, is tiny enough to fit ten individuals through the eye of a needle. Researchers found individuals measuring just 0.86mm in height. The discovery suggests that they are the smallest known terrestrial snails ever discovered. Angustopila dominikae, named after the wife of one of the researchers that discovered it, is very difficult to spot without the help of a magnifying glass. Barna Pall-Gergely, one of the co-authors of the study and a biologist from Shinshu University in Japan, said that the discovery was extremely exciting. He believes the species are an example of one that has been endemic to their habitat for so long that they were allowed to evolve to this extraordinary size. There were actually seven different “microsnail” species described in the study. Researchers combed the bottom of limestone rocks in Guangxi province to search for soil samples. The most similar species to the bizarre snails lives over 600 miles away in Thailand. Researchers still aren’t sure what made the snails so tiny, but the evolutionary advantage of their size must have been clearly defined by their ancestors millions of years ago. It takes a certain amount of cells to make a snail, and there couldn’t be any that are much smaller than these without their organs and tissues falling apart.